After Pilcher decides to turn off the electricity in Wayward Pines – with deadly repercussions – Ethan and Kate take the initiative to make sure everyone is out of harm’s way. Meanwhile, Nurse Pam confronts Pilcher on his decision and tries to convince him to reconsider, Ethan and Kate plan for an attack and the first generation tries to protect the future of Wayward Pines by taking matters into their own hands. 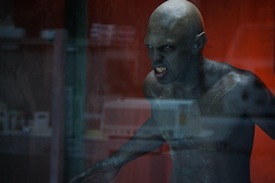 WAYWARD PINES has revealed a lot about the truth of the town in the most recent episodes — and among the most freaky of unveilings has been the closer look at the Abbies, the (deadly) only living creatures (outside of the residents of Wayward Pines) in 4028. By leaning into the Abbies’ similarities to humans, it allowed Hodge and the writers to take the terror over these creatures to a new level. If there’s any episode of WAYWARD PINES you’ll want to watch live, tonight’s hour will be it. The installment — appropriately called, “The Truth” — reveals a whole lot about what has been going on in the show’s crazy town. And unless you’ve read the books, odds are you won’t see the reveals coming. 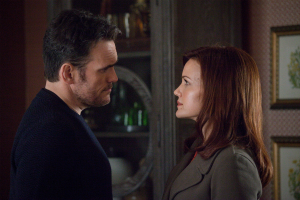 Fresh off WAYWARD PINES showcasing what happens when you break the town’s rules, things are getting more complicated for its residents, especially Matt Dillon’s Ethan. New faces are introduced (WEEDS’ Justin Kirk), while the fallout from Beverly’s demise impacts Ethan, Kate, and Harold. WAYWARD PINES will air a two-hour block on Fox tonight — a rerun of the pilot at 8 PM, followed by a new episode, “Don’t Discuss Your Life Before” at 9 PM — and things get crazy. Fox is debuting WAYWARD PINES — the network’s newest event series — tonight, and the twisted drama (based off the Blake Crouch trilogy) is deliciously fun. 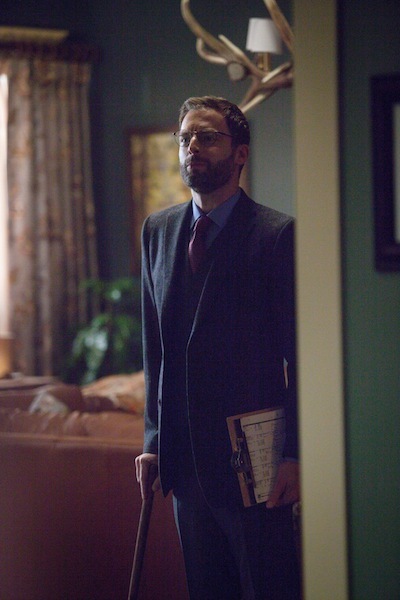 The show follows a Secret Service agent, Ethan Burke (played by Matt Dillion), who ends up in Wayward Pines while trying to track down a couple of missing agents. (One of whom is his ex-lover/former partner.) Unfortunately for him, once he arrives, he finds out he can’t actually leave the town…and the residents have to obey some very specific rules while they’re staying there. While the series sets up a fair amount of questions about what’s going on, WAYWARD PINES also pays off with answers well before the ten-episode arc ends…and they’re not the sci-fi-esque answers you might expect. Tags: chad hodge, wayward pines, what is wayward pines? WAYWARD PINES, the new Fox mystery event drama, won’t have its official Fox debut until May 14th, but the pilot is now streaming (until April 30th) to give fans a sneak peek at what to expect. The series follows a Secret Service agent (played by Matt Dillion) who is trying to track down missing agents, and is led to Wayward Pines. But finding Wayward Pines is much easier than figuring out what the heck is going on in the town…or trying to get out. WAYWARD PINES: Watch the Pilot Now! Comments Off on WAYWARD PINES: Watch the Pilot Now! Want to watch the WAYWARD PINES pilot? Fox has made the premiere episode available until April 30th. So don’t waste time — check it out now! WAYWARD PINES debuts on Fox on Thursday, May 14th at 9 PM. WAYWARD PINES’ official Fox debut is on May 14th, but you won’t have to wait that long to watch the pilot: Fox is making it available starting at midnight on April 24th via VOD. In what the network is dubbing “TV’s first-ever global preview for a new series,” WAYWARD PINES’ first episode will be available online and via On Demand to the U.S. and about 126 other countries until April 30th. WAYWARD PINES — the new event series from Chad Hodge and M. Night Shyamalan, and starring Matt Dillon — is coming this May, and from what I’ve seen, I’m obsessed. It’s full of twists, it’s messed up in the best way possible, it’s got a great cast/writing/premise, and it’s highly addictive. The series follows an Secret Service agent who is trying to track down missing agents. His investigation takes him to the town of Wayward Pines, and he quickly discovers things aren’t as peaceful as it would appear.